Most people spend close to one-third of their lives at their job. As a property manager, you should ensure that people in your building stay safe from electrical hazards. Have you noticed there are too many items plugged into your power strips? Do you have several power strips connected to reach a faraway spot? Taking steps to fix electrical issues lowers the risk of fires that could endanger people in your building. Keep the following electrical safety tips in mind for your building to help prevent hazards and injuries. Power strips provide a way for multiple items to get power from one outlet. However, it’s possible to have too much connected. When this happens the power strip won’t be able to safely handle the amount of electricity needed for all of the items. This can trip your circuit breaker or even start a fire. Consider an alternative option for electrical safety, such as having an electrician install additional outlets. You might need extension cords at times to plug in certain devices or equipment. While these cords can be useful, they can be a problem. You might be tempted to run them under rugs or carpeting, where they won’t be seen. However, this is a serious electrical hazard. Cords can become frayed, damaged, or worn from being walked on having chairs roll over them. This creates a fire risk. Cords can make an unsightly mess in your building, but you have to be careful about where you put them. Avoid putting cords across walkways or other areas that people pass through on a regular basis. Instead, place these cords along walls where they will be out of the way and out of sight. If you prefer, you can add removable wall clips to keep the cord where you want it. Overloaded circuits can cause a major fire risk. Office equipment that uses a large amount of electricity, such as copy machines, should have their own high amp outlet and dedicated power supply. Never plug this equipment in a standard outlet since they only handle a small amount of electricity. If your office has a kitchen, this electrical safety rule applies to refrigerators and other major appliances. Contact an electrician if you want to install a high amp outlet. Don’t wait for a problem to happen. Instead, check for electrical safety issues on a regular basis. 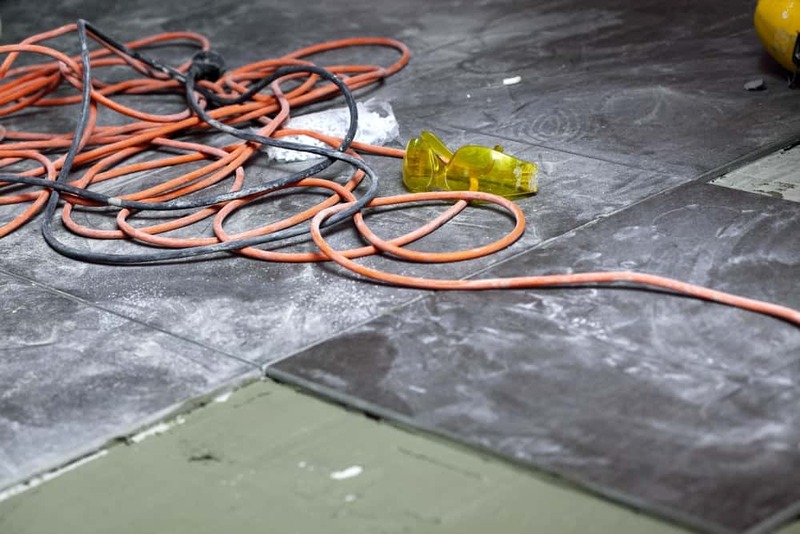 Walk through your building and check each area for problems, such as extension cords hiding under rugs. If anyone in your building notifies you about other problems, such as a faulty outlet, you should have a professional electrician repair it right away. You can handle simple issues on your own, such as moving a cord out of a walkway to prevent people from tripping. However, when you have a more complex problem to deal with, you’ll want help from a trustworthy electrician. These types of tasks require expert knowledge and training in electrical safety. Contact Turn It On Electric to have our commercial electricians review the electrical safety at your property.